"Earn The Bird! Love the MESA-PHX Marathon!" This was my 4th time at racing the MESA-PHX Marathon and I’m one medal away from earning my Arizona Copper Star! I represented the race as their Ambassador for the first time this year. The MESA-PHX Marathon is a highly organized race from their website registration process, social media, expo, race and post race festivities. This is why they sellout. The 2019 full marathon and half marathon distances were sold out! There were available 10k spots on race day. If you follow them along on social media, especially Instagram and Facebook, you’ll find they communicate well. Tons of updates, discount codes and weekly build-ups on how many weeks/days we have until race day. This momentum got me excited for race day. Packet pick-up is held only one day at the finish line the day before the race which is always held on a Friday. This is a like a pre-treat of what the finish line will be. There were tons of booths this year, more than last year. People were walking away with lots of good samples to try. The expo bag had full-size jerky and protein bars, fruit & smoothies from Sprouts, sample sized laundry detergent, snack sized chips and crackers. 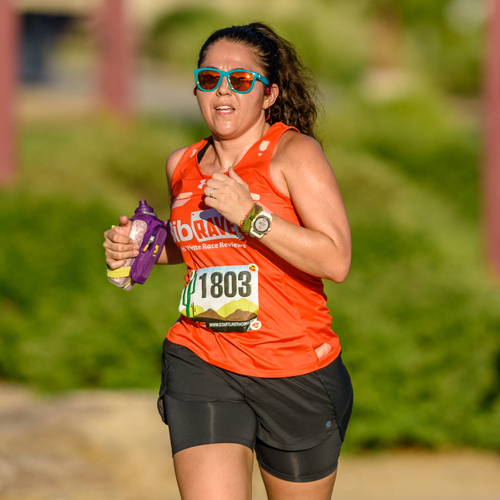 With race registration, you had the option to choose a black tank top or short sleeve tech shirt with the MESA-PHX logo that was reflective. The Altra Racing tent was also there selling lots of their most popular styles — that were open box — for 56% off retail. The packet pick-up process went smoothly, I even volunteered for a while to help the 10k runners. Race day means you must go to bed early Friday night. Not just to calm your nerves, but because the MESA-PHX is a point-to-point race, you must take a bus to the start line for all of the distances. This is a pain and a blessing. I love point-to-point races because you don’t see the same thing twice. Also, this helps with the downhill-ness factor of this race. There is only 20 feet of elevation gain. Taking the bus means you must get to the finish line parking lot by 5 am to catch the last bus at 5:15 am. The ride to the half marathon starting line took 10 minutes and then we had about an hour to wait for the half to start. It’s cold in Arizona in February. There are 30+ heaters at the half start line but I recommend wearing layers of clothing that you don’t mind donating at the start line. I was smart and bought cheap gloves to donate/ditch a few miles into the race. Also, I bought 6 heatsheets to pass out at the starting line to frozen runners! At 6:30am the race begins for all runners at all distances. Fireworks were set off and we were off! The start of the race is in the dark. I wore a visor with a light. The roads were good and we didn’t have to deal with potholes. There are lots of police officers on the course and the streets are safely blocked off. I totally felt safe running this race. Since we all start at the same time, if you finish your halves around the 2 hour mark, then the fastest full marathoners will be coming through to pass. The police were good at having the half runners move to the side to allow the fastest runners through. It was exciting to see the fastest runners pass me and pretty much all the half runners were clapping for them. The aid stations were plenty and full of lots of energy. The MESA-PHX has contests for the aid stations so the volunteers that manage them really step it up to show support and excitement for us. Crossing the finish line is a total treat. The shoot is long and filled with tons of people on either side. The emcee announces everyones name and as you cross someone quickly hands you a medal. After a 400m walk out of the end of the shoot, someone hands you a MESA-PHX hand towel and you could either make your way to the PR bell or the French Toast. There was a bottle neck going into the main booths for runners this year and I think it had something to do with the swag bag hand out process. Maybe people handing out medals should also hand out a swag bag. Since every runner wants their French Toast, the crew at Kneaders started putting the toast on platters and handing it out that way. Very smart of them. The booths at the end were filled with snacks, treats and goodies all full size. My swag bag was filled. It was insanely crowded at all the photo wall stations so I passed all of that up and headed to gear check to pick up my stuff. It was well organized by number and was able to pick up my stuff in minutes. If you are looking for a well organized, fun race that you could potentially PR at then I recommend the MESA-PHX Marathon. They pride themselves on having a high BQ rate. 26.4% of racers in 2018 qualified for Boston. "Cross the Finish Line on a Baseball Field! " 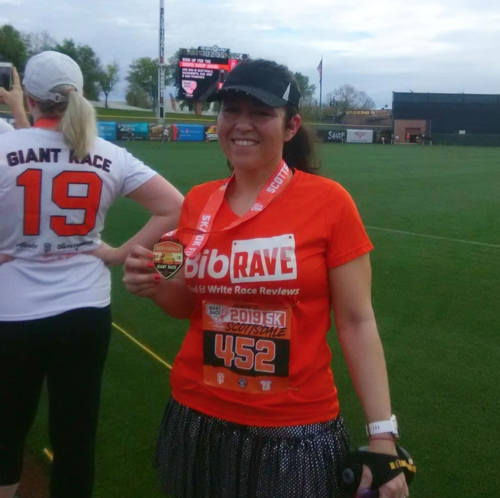 If you are a fan of the San Francisco Giants, love perfect weather, enjoy people-watching, touring a town on foot and running in general, then the Giants Race is for you. The people behind the Giant Race are excellent at communication. Email updates were sent regularly. If you follow them on social on either Facebook, Instagram or Twitter, then you got up-to-date info and they will actually respond to you. Even if you tag them in your posts! To me, that gives a personal experience to the race that I appreciate. Packet pickup is on the small side. I didn’t expect an expo but it did meet my expectations with lots of volunteers, easy bib pickup, free parking and a course map. Delivery options were made if you weren’t able to pick up your bib the day before. Also, if your time was really crunched, you could pick up your bib on race day although they recommend picking it up early. Race day was a blast! The energy was one of the highest I experienced at a race start. They had a singing cowboy, a cowboy on a horse greeting everyone and Native American dancers. It was VERY Scottsdale and I loved it. Seeing all the runners dressed in orange, black and white was surreal. Many people traveled from out of state for the Giant Race, I could tell by the locations the emcee was calling out after each racer crossed the finish line. I ran the 5k with 816 other people! The course was jam packed. The 10k had 423 entires. Although the course was beautiful and I enjoyed touring parts of downtown Scottsdale, the large amount of people made it hard to maneuver the course. Giant Race told runners that there wasn’t starting corrals and to find your spot in the corral based on how fast or slow you go. I stood in the middle of the pack at the start line because that’s usually where I fall. Instead, I should have stayed in the very front. I realized that many people walk the 5k and I had to bob and weave around other runners. Not a bad thing, but now I know to stay in the front part of the corral next year. Running through the finish line was exciting! We entered through the back of Scottsdale Stadium and headed down the dirt part on the outside of left field. A cowboy on a horse greeted us and we crossed the finish line under a canopy of orange, black and white balloons. After we received our medals, we had the option to sit in the stands or head to the food court area of the stadium for snacks. There were lots of places to sit and eat post-race and enjoy the beautiful Scottsdale weather. Thank you Giant Race for the fun time! 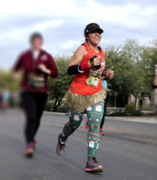 "PR On The RnR Arizona 10k Course"
The Rock 'n' Roll Arizona races are filled with energy and that's what I most love about them. This was my 3rd year in a row racing their Arizona race, the one that starts their 2019 race year. The past 2 years I ran the 1/2 marathon course and this year I decided to race the 10k because it fit in well with my training plan. 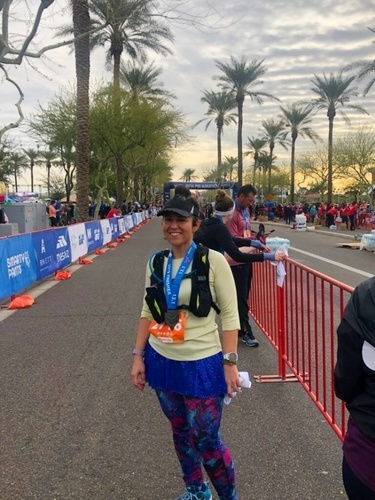 There are three top things I loved about the Arizona Rock 'n' Roll 10k: the course itself, the finish line festivities and how well organized the race was overall. 10k Course: I love the many options RnR Arizona gives to their runners. There is a 1-mile, 5k, 10k, half marathon and full marathon over the course of 3 days to choose from. My initial plan was to do a 3-day Remix Challenge that consisted of the 1-mile on Friday, 5k on Saturday and 10k on Sunday. It didn’t work out in the end, but I didn’t let that get me down. I opted for the Sunday 10k because I wanted to see where I was at my training and I wanted to see if I could PR my 10k time. For a gigantic race with tens of thousands of runners, this is one of the best races to start the year with. 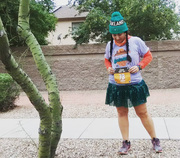 "The Sweetest People Watching Race"
The Hot Chocolate 15k is one of the only 15k races that takes place in Arizona. That makes race day super crowded, super fun and super sweet. 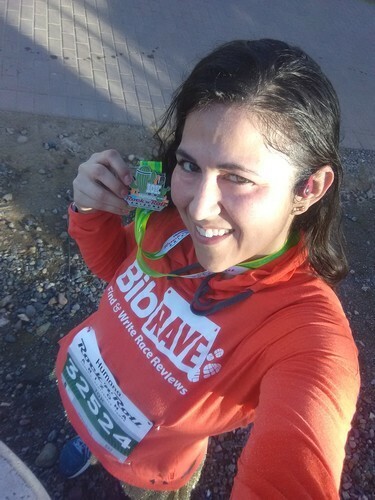 I ran this race in 2014 and 2015 and most recently 2018 on December 2. Pre-race: The people behind the Hot Chocolate brand have one of the most extensive and hype-worthy social media presence out there. If you follow them on Facebook or Instagram, you’ll see they post daily. And that’s a good thing! I was totally hyped up every time I saw their posts push through. Communication on their part was excellent. They let runners know about packet pick-up and how parking will be a struggle on race day. With the Hot Chocolate Scottsdale run, please know to pick up your bib early. I did on the first day as soon as the expo opened. I was in and out quickly and still had time to browse the vendors there. The jacket this year is incredible. It’s in a lovely, on-trend burgundy color. It’s super lightweight and oh so soft. It has a hoodie and thumb holes and pocket. It’s my favorite Hot Chocolate jacket yet. Yes, I did wear it 2 days in a row and almost wore it work over a dress. Race day: My alarm was set much earlier than normal and I hit the road knowing the 101 freeway would have closures (I read the email from the Hot Chocolate crew) and that parking will be crowded if I didn’t arrive before 7:15am. I got to the parking lot at 6:45am, there was a long line awaiting us. The volunteers got us through quickly. My race didn’t start till 8:15am, but the 5k started at 7:30am. I chilled out in my car for a while until my friends arrived. Since the 15k didn’t start for a while, I decided to use the porta potties. This is an area of a missed opportunity. There simply wasn’t enough potties to go around. The lines were about 50 people deep and there were 25 potties. I suggest doubling the amount for next year. Or, maybe take some of the potties from the finish line to the start line. I noticed so many empty potties at the finish. The corals moved quickly! That was great. And I was off! The course is nice. There are a few out and backs and that’s ok. Those out and backs made it fun to people watch. So many people dress up for the Hot Chocolate and it’s really fantastic to watch everyone. Even I wore a Sparkle Athletic skirt and Christmas tights. There was tons of water and Nuun at the aid stations. I was grateful for that. I was concerned about the Swedish Fish and gummy bears though. The cold weather made them very hard to bite into and I didn’t want to choke. The marshmallows were perfect. Maybe there could be chocolate flavored marshmallows next year. The finish line signs were perfect. I loved how a sign said I had 500 meters to go. That made me kick it in high gear. Then 400m to go, 300m, 200m, etc. It was great. I loved how the announcer said my name as I crossed the finish line. A volunteer quickly gave me a medal and I was off to get my spoils of the finishers chocolate mug. This is the best part really. I chugged my hot chocolate, it was the perfect temperature to do so. And starting eating my goodies after dunking them in melted chocolate. I noticed tons of empty porta potties and huge blowups to play in or take photos with, but I was tired and wanted to go home. Exiting the parking lot was simple, it was emptied out quickly and I’m a middle of the pack runner so there was still about 1/2 the 15k’er on course when I left. Post-race: I love race day photos. Hot Chocolate gives them for FREE. That’s a huge bonus in my book because I will purchase mine. Also, they came the day after the race. I am so thankful for that. Overall, I encourage you to run the Hot Chocolate Scottsdale 15k once if you haven’t already. "The Turkey Trot With Heart"
I never ran a turkey trot before. I know, I know, I’m in the minority here. It’s difficult for me because I have lots to do on Thanksgiving morning and driving to run a race doesn’t fit. Thankful for the opportunity to virtually run the Oakland Turkey Trot through BibRave. If you want to run a fun turkey trot with a whole lot of heart, then choose the Oakland Turkey Trot.